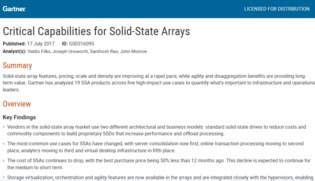 Gartner concludes that all businesses should be moving towards solid-state data centers within the next 5 years. This is no surprise, as recent advancements in the technology have finally allowed them to run mission-critical workloads smoothly. But with so many options on the market, how do you know which vendor to pick? To help you choose the best storage system for the needs of your individual workloads.